The Pekingese, a compact, stocky, heavily-built small dog, is a courageous dog breed, with a lion-like countenance resulting largely from its huge mane. It is more bold and with high self-esteem than dainty, delicate or pretty. Spoiling the Pekingese may result in aggression. The Pekingese originated in China. Pekingese range from 6 inches to 9 inches. Pekingese range from 7 to 12 pounds. Pekingese can be any solid color or particolor. Pekingese have long, straight and full-bodied coats. Regular brushing is required to prevent the Pekingese's coat from matting. The Pekingese is a very controlling dog breed and does not understand who the master of the house is. The Pekingese can be difficult to housebreak. Very suspicious of strangers, this dog breed makes an excellent watchdog. It is known to be stubborn. 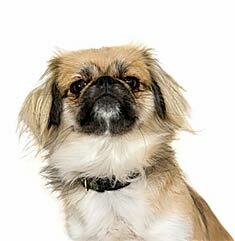 The Pekingese is susceptible to knee, eye, breathing and heart problems. This dog breed also has a difficult time giving birth. The expected life span of the Pekingese 13-15 years. Pekingese do well in apartments because they require little in the form of exercise. Some sort of activity is needed, however, to keep the Pekingese in good health. The Pekingese is in the Toy Group. This breed is over 2,000 years old and has changed little over the centuries. Affectionately known as a Peke, these tiny bundles of fur originated in China, where they were favorites in the Imperial Court. In fact, another name for the Pekingese is the Fu Dog, with Fu representing the Chinese word for happy. The Peke’s ancestry is intertwined with that of the Tibetan Spaniel, the Japanese Chin, the Papillon, the Long-haired Chihuahua, the Shih Tzu, and the Pug. 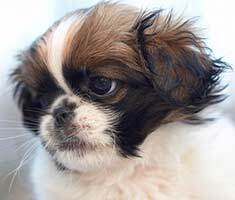 How did the Pekingese breed originate? Although the actual origins of the Pekingese are somewhat cloudy because it is so ancient, there are three charming legends surrounding the origins of the breed. In the first, a lion fell in love with a marmoset, but the lion was much too large. He asked Buddha to shrink him to the size of the marmoset. The tiny lion was the first Pekingese. In the second legend, the lion fell in love with a butterfly. They both went to Buddha to ask him to equalize their size. The Pekingese was the result. Finally, the third legend has a lion mating with a monkey, after visiting Buddha to care for the size difference. The match gave the offspring the nobility of a lion and the bowlegged walk of a monkey. 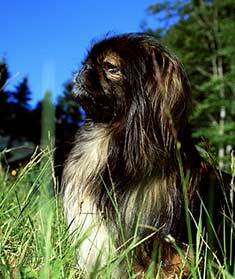 Pekingese have their origins in the temples of ancient China. 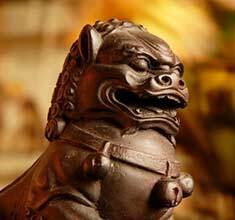 In all of these legends, the involvement of Buddha in the origins of the dog meant that the dog belonged in the temples of China. He was small enough to explore and ferret out any demons that might be in the temple, and he was so fierce from his lion ancestry that he could destroy even the largest of demons. What does a Peke look like? Originally bred with a spaniel-type coat, the Pekingese is usually shown today with a long-haired coat in just about any color combination. The majority of Pekes are either gold, red, or sable, but the breed standard allows for light gold, cream, black, white, sable, blue, or black and tan. The dogs weigh from 7 – 14 pounds and stand about 6 – 9 inches tall. Dogs over 14 pounds are disqualified from the show ring. Smaller Pekingese may be called sleeve Pekingese or “sleeves” because Chinese emperors used to carry the smallest dogs in the sleeves of their robes. The head of a Pekingese is very large in proportion to his body. The massive topskull is flat with wide set, bold eyes and a broad lower jaw. The face is flat and slants back slightly from the chin to the forehead. Ears are heart-shaped and lie flat against the head. The broad, short nose is black with wide open nostrils. A hair-covered fold of skin, known as the wrinkle, separates the upper and lower areas of the face. The wrinkle goes across both cheeks, ending in a slight V over the bridge of the nose. The Peke body is pear-shaped and low to the ground, with a high tail arched over the back. The forelegs are slightly bowed, with the front feet turned slightly outwards. The rear legs are straighter and the back feet point straight ahead. The Pekingese has a double coat, composed of a long, straight top coat and a thick, soft undercoat. There is a mane around the neck and shoulders, giving the dog its nickname of “lion dog”. How do I care for my Pekingese? A healthy Pekingese coat requires daily brushing and visits to a groomer about once every three months. This keeps the coat clean while preventing tangles. If you do not intend to show your Peke, there is no need to mess with the longer coat, as you can just have the groomer cut him in an easy to care for, all-over short style known as a puppy cut. Diligence in grooming will help to control the moderate shedding associated with these hairy dogs. Daily face washing is important. You must clean out the corners of your Peke’s eyes and along the facial wrinkle to prevent the formation of hotspots. These painful sores can form in a hurry and are sometimes difficult to clear up, particularly on the face. What can I expect from my Peke? These stubborn, jealous dogs usually become attached to one person, towards whom they will be both loyal and protective. The Pekingese is not generally great with children or other animals, but he can be socialized to accept them. Care should be taken with any Pekingese, as they have been known to bite both other animals and people. Pekes are notoriously hard to train, not because they are dumb, but because they don’t see the benefit of training. They learn best from positive training methods, whereby they are induced to perform because they associate good performance with attention and treats. 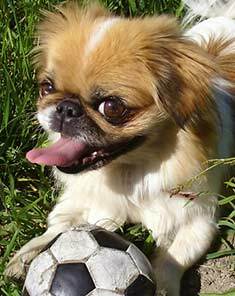 Are there any health problems associated with the Pekingese? Because of their small size, you must take some care in handling your Pekingese. Although they are not fragile, like most toy breeds they cannot tolerate overly rough play. Their long bodies and short legs make them susceptible to slipped discs and dislocated kneecaps, so they should be discouraged from jumping up on furniture. Cumulative damage from rough play or jumping up and down can lead to bone and joint problems including arthritis. When you pick up your Peke, make sure to hold him both at his chest and his belly, providing support for the entire length of his spine. The breed is relatively low energy, so they don’t need daily Frisbee games on the beach or frequent romps at the dog park. Short walks around the neighborhood should suffice for exercise, keeping your dog trim enough to prevent joint problems. Like other brachycephalic breeds, the Pekingese can have trouble breathing. The wide head and flat nose of these breeds restricts their respiratory effort, giving them low endurance for exercise. If you notice your dog panting and wheezing, it means he needs a break. It is important to provide adequate shade and water for your Pekingese. Because they often have trouble breathing and because they have so much fur, it is quite easy for them to overheat. They should not be left outside on hot days, and must have access to a cool part of your home if you don’t have central air conditioning. Heat stroke is a medical emergency as it can quickly result in death. If your dog has been outside in the heat and begins to look fatigued or disoriented, you must get him to a vet immediately. 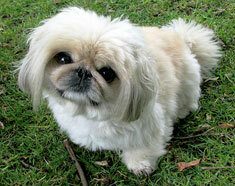 Like many smaller breeds of dog, the Pekingese can suffer from congestive heart failure. If the heart muscle becomes weakened due to high blood pressure or leaky valves, the animal’s blood will back up into the lungs. The dog will become less active and have difficulty breathing as the disease progresses. Due to the lack of oxygen, the membranes in his mouth can become grey rather than their usual pink. If you live in a smaller home or can’t get out to exercise a large dog, the Pekingese may be just what you are looking for, particularly if you don’t have small children or other animals. Just make sure you are willing to commit to the time required for grooming and maintaining the health of our dog before you decide to adopt a Peke. Find Pekingese Puppies with our Free Breeder search!